The cricket world was shaken last Saturday when reports from Cape Town, where the third test match between Australia and South Africa was being played, sent shock waves across the globe. Australian batsman Cameron Bancroft was pictured on TV trying to tamper the ball as he pulled out a yellow object (later confirmed to be sandpaper) and rubbed it on the ball in order to make it reverse swing. When Bancroft realised that he had been caught, he hid the "object" in his trousers. The umpires questioned him during the game and he responded by saying that it was just an ordinary cloth. After the match, the player along with captain Steve Smith admitted that they conspired to get an advantage in the match. Bancroft also appeared before the media and he said: “We had a discussion during the break and I saw an opportunity to use some tape, get some granules from rough patches on the wicket to change the ball condition. It didn’t work,”. Australia captain Steve Smith, vice-captain David Warner and batsman Cameron Bancroft have been sent home from South Africa for ball-tampering in the third Test in Cape Town. 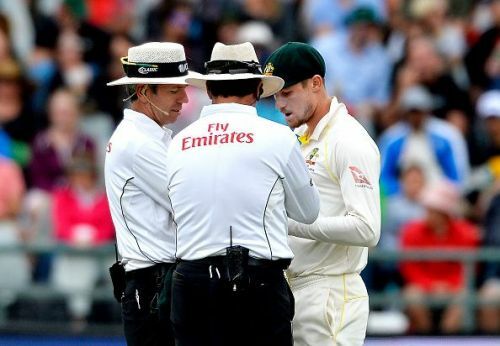 The ICC reacted to the issue by handing Smith a one-match suspension and was fined 100% of his match fee while Bancroft was fined 75 percent of his match fee and was handed three demerit points for breaching Level 2 of the ICC Code of Conduct. Cricket Australia today announced that Steve Smith and vice-captain David Warner have been banned for 12 months while Cameron Bancroft has been given a nine-month suspension. The incident is one of the hottest talking points in world sport at the moment and sportsmen from all spheres has had their say, including ex- Australian Football team captain Tim Cahill. Speaking before the friendly against Colombia on Tuesday, the striker said: "We're in a professional environment inside our camp and our focus has to be on preparing for the game on Tuesday night, preparing for the bigger picture of Russia." "Being an older player it's important you move the papers out of the rooms where the guys are, and make them just focus on why they're here," he added. "It's a sad moment for Australian sport. We're very proud of where we come from." "It's time now to try and make right for sport in Australia as a whole and we can play our part in that as a team and a squad, by leading on and off the park on Tuesday night, setting examples and representing our country with pride." Asian Cup 2019: Jerseys of all 24 nations - Which one looks the best?